“If girls and young women are often thought of as the forgotten drivers of development, their sexual and reproductive health is almost entirely absent,” says the Guttmacher Institute’s Heather Boonstra in this week’s podcast. Speaking at the launch of the latest State of the World Population report, which focuses on improving health care for adolescent girls, Boonstra highlights three actionable recommendations from the report: promoting the right to age-appropriate, comprehensive sexuality education; reaching girls 10 to 14 years old; and investing in appropriate services for young people. 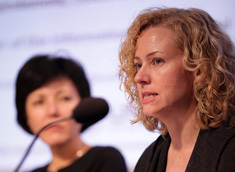 Boonstra spoke at the Wilson Center on October 30 for the launch of UNFPA’s State of the World Population 2013.